Can be fully automated - extraction and injection performed on-line using one syringe on an LC or GC autosampler. Significantly reduces the volume of solvents and sample needed. The MEPS product consist of two parts, the MEPS syringe and the MEPS bin. 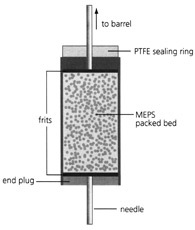 The cartridge contains the SPE phase, and is built into the syringe needle. The bin is used with a 100 µl or 250 µl gas tight MEPS syringe that allows fluid handling at normal SPE pressures. Sample Size and Sensitivity: Sample volumes can be as little as 10 µl, or alternatively one can concentrate larger samples e.g. 1 mL or more by taking multiple aliquots of 100 µl or 250 µl. Automation: The ability to prepare and inject samples on-line using a single device reduces sample processing times and operator intervention. Typical bin life is conservatively about 40 - 100 samples, depending on the sample matrix. The small quantity of phase in the MEPS cartridge can be easily and effectively washed between samples which removes the possibility of carry-over. This process simply is not practical on conventional SPE devices. Flexible and Easy to Use: MEPS is available in a variety of common SPE phases. The dimensions of sorbent bed ensure that the sorbent performance remains identical to conventional SPE devices used for extraction of similar samples. When the bin is exhausted, or another phase is required,the bin is easily exchanged by simply unscrewing the locking nut and removing/replacing the cartridge. Sample preparation for complex biological samples is readily adapted to MEPS and reduces the volumes of sample and reagents required for extraction when compared with conventional SPE and other “micro extraction procedures”. The MEPS approach to sample preparation is suitable for reversed phases, normal phases, mixed mode, and ion exchange chemistries. MEPS bin can be used for sample volumes as small as 10 µl making them particularly well suited to on-line use with LC/MS analysis of volume limited samples. The current range of syringes when used in Thermo Fisher Scientific and CTC Analytics auto-injectors do not require modification of the syringe mount. Cartridges are available in needle styles to suit LC and GC applications. Needles are packed in a sealed blister pack of 5 needles to ensure their integrity. A highly efficient and reliable micro fluidic platform that improves your GC connectivity to enable maximum chromatography performance.